3 Who are those physiotherapists? 3.1 What do they do? 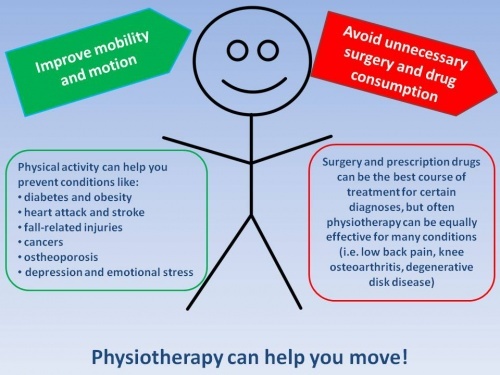 4 Why is physiotherapy useful? This page is meant to be a little resource of information for all those people who are not physiotherapist and would like to get to know what are we talking about. If you are a healthcare provider (i.e. physician, nurse, etc.) you may find more useful to proceed the navigation to pages like this one, as you are probably already comfortable with specific terms. You may have heard words like physical therapy or physiotherapy, and the same is for the person who provide it: physical therapist or physiotherapist. And maybe you asked yourself "What's the difference?"... well the answer is: none. Those names vary based on the country of origin, i.e. in the US physical therapy is provided by a physical therapist, whereas in the UK or Australia it is physiotherapy provided by a physiotherapist. Physiotherapists even have a World Confederation for Physical Therapy (WCPT) which represents them worldwide and sets the pathway to move the profession forward, in order to improve health and wellbeing globally. Physiotherapy helps restore movement and function when someone is affected by injury, illness or disability. Moreover, physiotherapy is a healthcare profession that assesses, diagnoses, treats, and works to prevent disease and disability. If you would like to start understanding what really could do physiotherapy even in small things, take a look to this short heart-warming video from Australian Physiotherapy Association (APA) starring their mascot Mojo. As you may have understand from the video, physiotherapy is suitable for a variety of conditions at all stages of life. "Physical therapists provide services that develop, maintain and restore people’s maximum movement and functional ability. They can help people at any stage of life, when movement and function are threatened by ageing, injury, diseases, disorders, conditions or environmental factors." Physiotherapists are experts in movement and function who work in partnership with their patients, a physiotherapist can also help prevent further injury by listening to patients needs and expectations, working together to plan the most appropriate treatment for any individual condition, including setting goals and treatment outcomes. 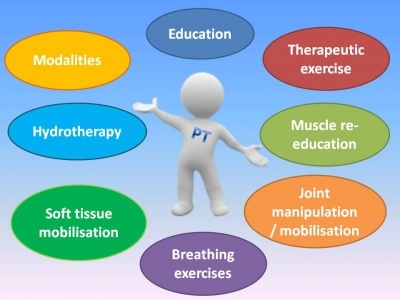 In the picture below, you can see with how many different methods a physiotherapist can help a patient. Physiotherapists are trained professionals who can use a wide variety of methods to help you. Evidence-based medicine is the integration of best research evidence with clinical expertise and patient values. Physical therapists are evidence-based health care professionals, which means they will always try to provide the best treatment available from research, tailored on the individual. As you may have already understand, a physiotherapist can get you on track to have pain-free movement, which is essential to be able to do your favourites physical activities, so preventing a lot of chronic diseases, and have some good time too. You can recover well from a large variety of conditions with physiotherpists' help. Moreover, even if surgery and drugs can be the best course of treatment for certain diagnoses, there are conditions in which physiotherapy can be equally effective. Take low back pain as an example. There is evidence this condition is over-treated with imaging, drugs prescription and surgeries, while early physical therapy can be a really cost-effective treatment. It is the same if we talk about moderate meniscal tears or knee ostheoarthritis, again physiotherapy can be a first choice treatment. And what about non-traumatic rotator cuff tear? Guess what? There is no differences between surgery and physiotherapy treatment in terms of outcomes. So why choose surgery? Anyway, any individual is unique, therefore physiotherapists work in team with other healthcare professionals, to try to give you always the best treatment you need. 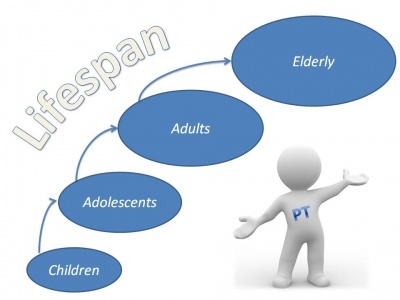 Physiotherapy / Physical Therapy page on Physiopedia, with deeper description of the profession. World Confederation for Physical Therapy (WCPT) site. MoveForwardPT is a site to provide informations to patients powered by the American Physical Therapy Association (APTA). Chartered Society of Physiotherapy (CSP) site. Australian Physiotherapy Association (APA) site. Canadian Physiotherapy Association (CPA) site. ↑ Sackett DL. Evidence‐based medicine. John Wiley & Sons, Ltd, 2000. ↑ Durstine JL, Gordon B, Wang Z, Luo X. Chronic disease and the link to physical activity. Journal of Sport and Health Science. 2013 Mar;2(1):3–11. ↑ Kruk J. Physical activity in the prevention of the most frequent chronic diseases: an analysis of the recent evidence. Asian Pac J Cancer Prev. 2007 Sep;8(3):325–38. ↑ Mafi JN, McCarthy EP, Davis RB, Landon BE. WOrsening trends in the management and treatment of back pain. JAMA Intern Med. 2013 Sep 23;173(17):1573–81. ↑ Fritz JM, Brennan GP, Hunter SJ, Magel JS. Initial management decisions after a new consultation for low back pain: implications of the usage of physical therapy for subsequent health care costs and utilization. Arch Phys Med Rehabil. 2013 May;94(5):808–16. ↑ Katz JN, Brophy RH, Chaisson CE, de Chaves L, Cole BJ, Dahm DL, et al. Surgery versus Physical Therapy for a Meniscal Tear and Osteoarthritis. New England Journal of Medicine. 2013 May 2;368(18):1675–84. ↑ Kukkonen J, Joukainen A, Lehtinen J, Mattila KT, Tuominen EKJ, Kauko T, et al. Treatment of non-traumatic rotator cuff tears: A randomised controlled trial with one-year clinical results. Bone Joint J. 2014 Jan;96-B(1):75–81.